Pixopedia doesn’t initially look like the most powerful of graphics tools. Small flat buttons present various ugly and cryptic icons; even the more obvious ones don’t behave as you’d expect; and there’s no bundled Help file to consult, not even any obvious menus you might browse for clues. Don’t be tempted to give up, though. The program is quirky in the extreme, but once you’ve learned a few basic tricks then life becomes much easier. Press [F1], for instance, and a menu appears for the currently-selected left toolbar option. By default this offers an impressive 26 "Drawing Modes": Normal, Scaled, Erase, XOR, MinMax and many more. Clicking any of these displays its related options, and you can just click and drag on the screen to see its effect. Exploring the left-hand toolbar (with the menu displayed) reveals many other interesting tools. 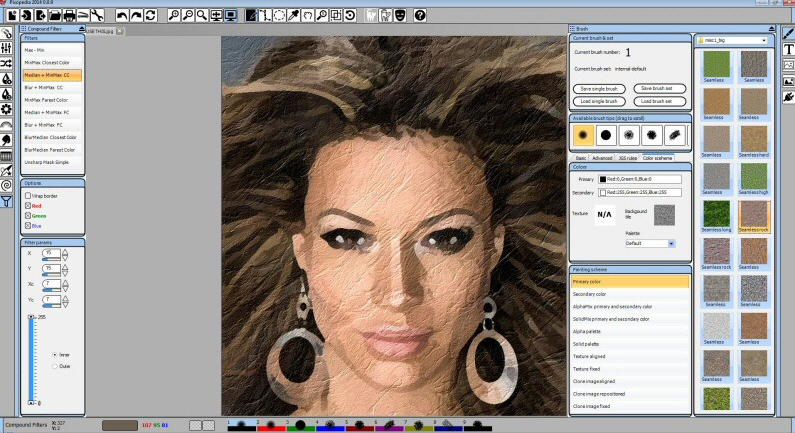 You can "paint" with various clipart objects (bushes, flowers, butterflies, marbles, beads and more); apply 20 very configurable "warp modes" (Explode, Waves, Splash, Twirl); twist and shift colors; set various symmetrical drawing modes, and apply a host of useful filters. Clicking the "Image Tools" button on the right gives access to assorted image manipulations and tweaks: flip, mirror, rotate, resize, and various automatic enhancement tools. Basic? Maybe, but the Plugins button and you’ll find Pixopedia supports Photoshop-compatible filter plugins (*.8BF), so there’s plenty of scope for adding more. By way of demonstration, the program comes with 20 (mostly very good) examples from providers like Richard Rosenman, Mehdi, Redfield, Flaming Pear and Dragonfly. And the feature list goes on with various selection modes, a range of shape drawing options, a configurable text tool, and what just might be the most configurable brushes we’ve ever seen in any free paint program (or most commercial ones). There are plenty of frustrations here, all kinds of rules you must learn. Even functions as simple as "Flip" or "Mirror" have quirks; you can’t activate them with a click or double-click, and must instead select the tool, and click an "Apply" button. Pixopedia can do so much, though, that it’s certainly worth at least some of your time. The best approach is concentrate on one part of the program, where your efforts will be quickly repaid. We would start with the image warping tools, perhaps the Photoshop plugins; they’re easy to learn, yet probably capable enough to justify installing Pixopedia, all on their own.